Who among you who are still hooked up and still have the hangover from the fight of the century? That's Floyd Mayweather and Manny Pacquiao's fight last Saturday (May 2, 2015) in Las Vegas. For sure after the fight, everyone is disappointed in the results (if you are on Manny's side), Floyd won. If you actually open the social media sites, you will see flooded memes about the fight, saying that floyd is gay, that he runs (that he should join a marathon), that this is the end of boxing, how come he won if he actually didn't do anything, that floyd is a cheater. The fight is really spectacular and watched by everyone. 9gag, from it's instagram account said "Manny's post-fight interview is gold #Macpac #respect #9gag" cause Manny said "i thought i won the fight..... he didn't do nothing, he always run"
And everyone just became a boxing expert! haha, i don't know about boxing so i have nothing to say if floyd actually cheated cause i heard from some boxing analysts that what floyd did is a strategy to win. I'm not here to talk about what happened on the fight actually, this is a post about the true character of a warrior----Manny Pacquiao. Manny started as a poor boy, from a poor lifestyle, until he became famous because of boxing. At the early stage of his career, lots of Filipinos started admiring him because of the skill he has in boxing. He has that compassion from the very beginning, but just like any other human, he still a lot of troubles and issues going on with his own family, money and relatives. Two years ago, many converted to Christianity (born-again as they say) and i think that, truly how everything changed his life. In his first fight after his conversion, he lost and a lot of people blamed it on his shift of religion. That's how the Lord tested him. He remained faithful. Blessings started to flow even more, restoration on his household came, the desire to give glory to the Lord has gone higher. The world became a witness of how God has delivered him from glory to glory. At his current fight, he kept on shouting that God will favour him in this fight, that he will have the victory, suddenly, Manny lost the fight. But see? just like everybody else is saying "Floyd won the title but Manny won the hearts of the people", that, i think is what victory is all about, not your title, fame or money, its about who you are as a person and as a player in the community. In this life, our everyday struggles are totally not of certainty, our great plans in our lives could not really just happen in a snap as to how we planned it. We must pray. God is the driver of our life. Something might not quite work for a while and everything's a mess but the Potter knows what He's doing, just have a lot of faith!. 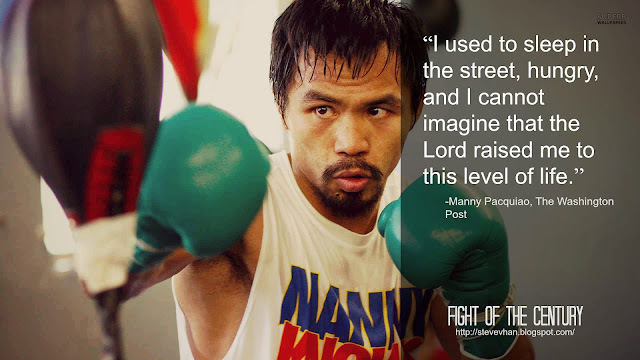 Manny Pacquiao, considered as one of the best boxing fighters of the world, basketball coach, singer, congressman, won the hearts of the people, a good father, a loving husband, a good son and sibling, a faithful servant of God who is bold to testify of how God can move to the lives of the people gave the best example of trusting and standing firm on God's plans. The victory that God gave him is not of this world but beyond what our eyes could see, the respect, love, admiration of people. Manny, thank you for inspiring us, for showing to the world that title is just a label, that God can change your life upside down, we love you Man - ny! We are so proud of you kapatid! It certainly was very disappointing. I hope there will be a rematch soonest. Indeed! :) But i think manny didn't have to prove anything, rematch or not, He's the champ. Thank you for this inspiring sharing. God is Emmanuel and faithful. How inspiring! Winning the hearts of people is better than winning a fight, any day, in my book. A real life story of "rags to riches". Ikaw ang champion sa puso ng mga pilipino at ng buong mundo. Mabuhay ka, Manny Pacquiao! Really wonderful post and incredible story! I am Lawrence from Boom Collective. We are a digital advertising agency that spans Australia, New Zealand and the Asia Pacific. Currently, we have a product named Boom Tick that makes use of video ads for CAPTCHA. We're very excited about this because it gives you a chance to earn money for your blog if you place it in your Contact Us page or forms in your website. I hope that you can be our partner with this new product. Looking forward to your response. Feel free to ask me whatever questions you may have regarding it.